Four Sword Mystery Set - Random Selection, Customer Favorites, High Quality, Deep Discount | BUDK.com - Knives & Swords At The Lowest Prices! Have four times the fun with this exclusive Four Sword Mystery Set! 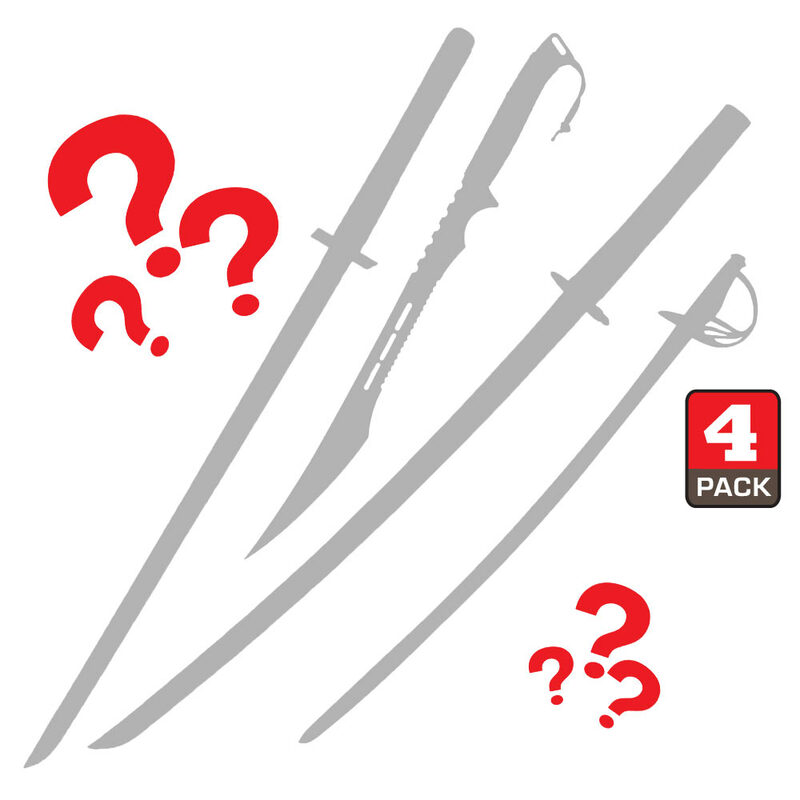 Each one of the mystery sets contains four of our customers’ favorite, top-picked swords. 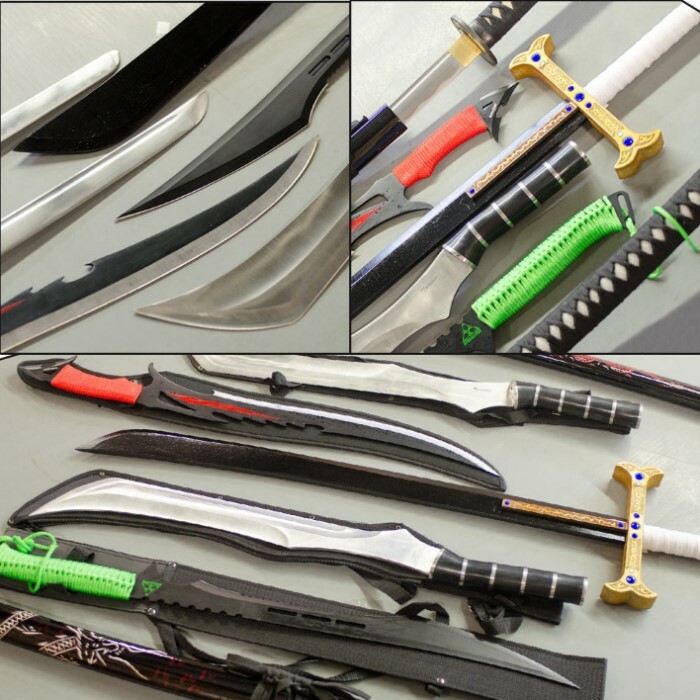 Enjoy these high-quality swords at a deeply discounted price. Rather than let these products collect dust on a shelf, we have decided to slash the prices and offer them to you as an exclusive surprise set. Save nearly 30% off MSRP, but don’t wait; supplies are extremely limited! I received my mystery sword box and yes i feel it was worth the 49,99 dollar price with what i received. I got a mystery fantasy cut out sword and 3 blank dull no edge plastic sheath Katanas. Was kinda disappointed i gave the Katanas to my adult sons to hang on there walls or what ever , just wish out of 4 swords one would have been semi decent with a edge. The wall hangers, one of which is surprisingly sturdy and heavier than the others (very close to the replica Last Samurai katana), and a short fantasy blade. Fantasy blade is a steel cutout type, black with a blue flat grind that while nice to look at, would likely hold up well if you needed it in a pinch. Easily a 5 star purchase and will be planning to purchase more of these in the future. Assuming the next set are at the very least different katanas, then I can see amassing a reasonable variety for a more than reasonable price here. I have purchased 2 of these already (one month apart). In both I recieved 3 katanas and a fantasy sword. Which I guess is the way they do it because after reading the other reviews it seems they all got 3 katanas and 1 other sword as well. Out of the 6 katanas, 5 were really good quality. The other one has a really loose blade. Out of the 5 good quality ones 2 were sharp. The 2 fantasy swords were the exact same sword (which is fine cause they look better as a pair in my opinion anyway) and both were razor sharp. All in all worth the money if you looking to either start a collection or just get some nice swords for really cheap! I am giving it 5 stars because you really can't beat this price and katanas are my favorite swords. If you are hoping to get more than 1 other sword out this box though you may be bit disappointed. However if your like me and love katanas you should definitely buy this! I woulda prefered 1 katana and 3 others swords but i got 3 katanas and a pretty interesting machete. I love the craftsmanship artwork on them though. And one seems to have a pretty nice warp sadly. I was hopping for atleast one Shinwa. Well I got 3 display Katanas. And an actual working secret agent tactical sword. But because all 3 katanas are very decorative and beautiful and overall exceeded my price it gets a solid 4 start. I'll be buying sword stands and hang them in my room. So if you're looking to decorate your room with swords and nothing else I'll recommend it. I'll be buying again. I received 3 katanas and a fantasy sword. The three katanas weren't of high quality but still really nice. I would buy this again if they change up the swords you have a chance of getting. I would love to see a Viking sword and a medieval knight sword in the mix. I just got mine today, theee stainless wallhanger katanas and a stainless cutout sword. Nothing I would personally buy but it’s whatever, you get what you get when you go the random box route.